Most of our cats are happy staying indoors, but many kitties love playing in the snow. It may seem odd to think that a feline would enjoy getting their paws cold and wet, but cat logic is impossible for our human minds to understand. One cat even went so far as to build an igloo in the snow! Check out the video. Watch what this cat does after a snowstorm in Colorado! Isn’t that amazing? Would your cat enjoy playing in the snow? Would they dig an igloo? 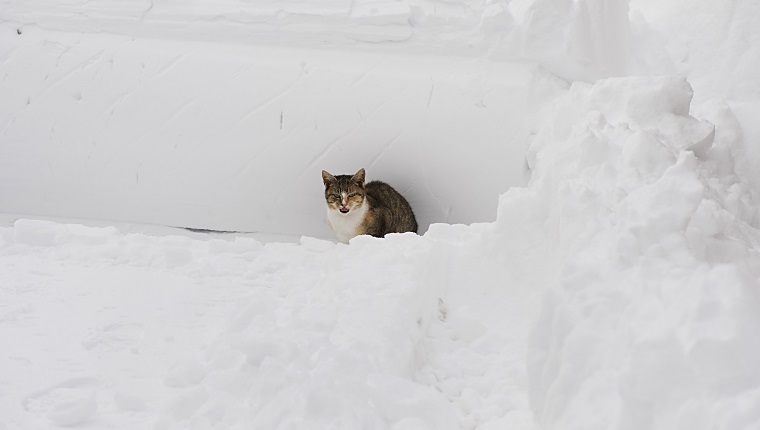 Playing in the snow can be a lot of fun, but don’t forget that there are dangers for cats in winter, including antifreeze and frigid temperatures. Make sure your cat is safe if they play outside. Of course, we shouldn’t forget about the outdoor feral cats and strays in the neighborhood, either. They could use some help staying safe in winter, too. You can always make some homemade shelters and leave food out for them. They’d appreciate your efforts. If the snow isn’t your thing, and your cat is happy staying inside, you can just curl up by the fire and enjoy the pretty snow from the window. That’s a nice, cozy way to enjoy the season and spend some quality time with your cat! Would your cat like to go outside in winter, or are they happy to cuddle up with you under an igloo made of blankets? Let us know in the comments below!